NOTE: For 2003 to 2004 A6 or a 2003 to 2005 Allroad only with the irregular shaped irregular connector. Picture shows the earlier pump that looks 95% the same, the only difference is the connector. You WILL receive the correct part for your car, the picture is just used for reference until we update the picture on this page. This is the auxiliary water pump which resides underneath the intake manifold of the 2.7T engine. The factory unit commonly leaks and this OEM Bosch replacement has an upgraded sealing flange to prevent leaks in that common place of failure. When replacing this pump you have to lift up, or remove the intake manifold so this is a great time to upgrade with intake spacers to keep your intake temps a little lower and add some performance. 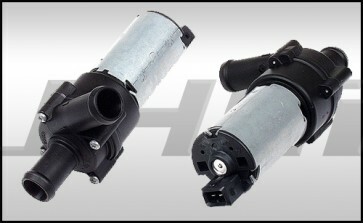 Check our engine parts section for these.